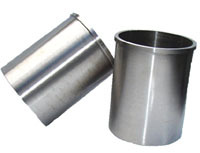 Our replacement cylinder sleeve for the Weber MPE-750 engine is offered for the customer that prefers to replace the original Nicasil plating with our cast-iron cylinder sleeve. The replacement sleeves offer excellent performance & wear resistance with both OEM & our high performance 85mm (standard bore) pistons. Custom installation is available, or installation can be performed by machine shops that are equipped for cylinder sleeving & boring. (2 sleeves are required).